It's the easiest and fastest way to move your trailer anywhere. Owning an RV or boat trailer is everyone's dream. Backing or moving the trailer in tight locations can be a nerve-racking nightmare for most, and at times impossible because to the length of the vehicle and trailer. You may find yourself at campsites that require you to pull the tailer through the site so that the RV trailer doors face the cooking area, bonfire pit etc. But because another RV is parked ahead of the pull through area, you simply can't drive all the way through, forcing you to park your trailer in the wrong direction. TRAX Power Trailer Dollies takes on all the hard work and hassle you find yourself when moving and parking your trailer. 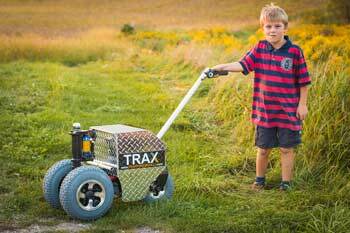 Simply connect a TRAX power dolly to your trailer's hitch ball receiver and within seconds you are effortlessly pushing, pulling and steering your trailer to its perfect location. It really is that quick and easy to use! Easy to use power trailer mover | We make parking trailers into child's play!